Bought a SSD cached plan. Performance is fast enough for me plus I needed the addtl storage. Bought a ssd server here on their last offer. Ive been pretty happy with it. They offer a bunch of different Linux OS options, and TUN/TAP is supported if anyone cares for it. 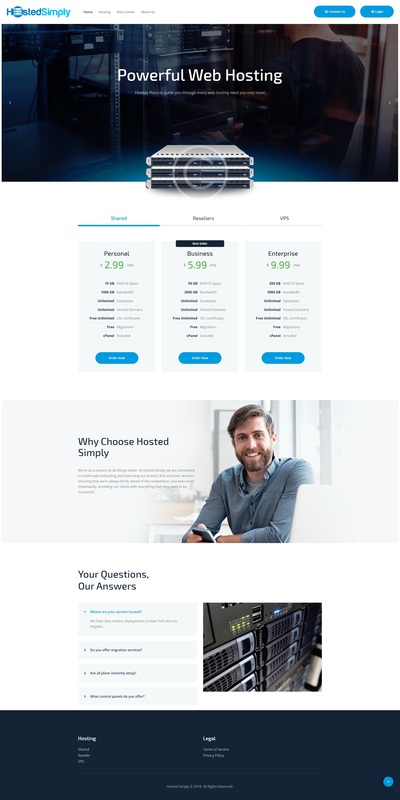 Has anyone tried this hosting company to see how it is ? I have been using 5 of their VPS and continue having issues with the servers being suspended due to cpu usage. Repeatedly without backup, etc. Suspended server, justified by CPU load (4 CPU, 4GB ram) on VPS was about only 10 WordPress presentations with a traffic of about 100 people a day. However, VPS was constantly under the onslaught of SPAM bots, various intrusion attempts and the like. Do you give 24 hours time before taking action to your VPS customer or not? I asked for the reason with support ticket and that was forwarded to admin department. I patiently waited over 3 weeks but No status has been updated. if that was the case, I will just admit my case, but the fact of not getting any status update is Unprofessional. Just my experience on the service the psat 2 days. I ordered a Pure SSD 4GB, on the ordering screen, there is no option for the data center LA. I submit a request for upgrade to 1Gbps port and asking for LA DC. The response from the customer service Shane was prompt. They moved my container to LA and upgraded the port. The speed was good using the bench.sh script. The SSD disk benchmark was 1.8Gb/s and network speed was fast 70-80MB to various test points in the US. I’m please that they did not overload the server like BigFoot or SupremeVPS, I had horrible experience with those two, got downtime in the 10+ hours the first 2-3 days and servers keep crashing. Happy so far, so I would recommend you trying out. You have been warned. These guys are scam artists. DO NOT BUY! Poor performance, low up-times. Explanations for poor performance is never answered. If something goes wrong and you ask for a refund, they ignore your requests. I have had a request in for more than a month or more and it’s not ever answered properly or mostly ignored. Bought 4GB Pure SSD 2 days ago. Customer Service is very responsive when I opened my ticket about port upgrade and moving toe LA DC when it wasn’t available when I bought the VPS. Speed test are good, server is responsive and doesn’t seem overloaded like BigFoot or Supreme VPS. One is is it’s fixed VPS, you can’t split up the resources into multiple VPS. Happy so far and hope they don’t overload their servers. All of these positive reviews feels like paid advertising, these guys are scam artists. As soon as you have an issue they ignore your requests. I have a small VPS with them for about a couple of months now. At first the response of the machine and the turn around of the tickets was good but it has been gradually deteriorating. Right now their 1Ggbps line seems incapable of up/downloading more than 10 bytes in two minutes and tickets go unanswered for weeks. I had not been demanding or even loading up the server anywhere near to the promised parameters. 10 bytes in two minutes. Seriously? Yes, it got to that. They must have totally overloaded my node or line or something. I complained and they moved me to a new one and it has been running well since then. Keeping fingers crossed. I also got an OpenVZ VPS from them since November 2018. It performed OK at the beginning, but recently they overloaded the host node so much (possibly with the offer above), that it is slow as hell. I got a VPS that is supposed to be 1 GB RAM, but it started swapping as soon as it reached about 128 MB RAM usage. Also, this is an SSD cached host, it is extremely I/O overloaded. I am doing an apt upgrade now and it gets stuck for minutes unpacking single packages. So it winning the race to be the slowest VPS I’ve ever experienced. To be fair: I opened a ticket about this, and while they denied overloading the host, they offered to move me to another host node. I haven’t tried that option yet. As in the case of Leo above, I opened a ticket and asked them to move my VPS to another host, which means I got a completely new VPS on another host (they have warned me that all data will be deleted in the process). The new one works better so far, keeping fingers crossed. My VPS was not responding this morning, opened ticket, the host came back about an hour later, ticket was dealt with. This host is not much different than the one I was migrated from. Can anyone explain why the VPS guest would start swapping if there was actual free memory? This tells me, that even though I got an 1 GByte VPS, I have around 100 MByte for my VPS on the host, after that it starts swapping. I guess it is the same for everyone. VPS is constantly rebooting, constantly excusing the load and canceling. Though the biggest burden on the web is how Apache waits to check out the connections in their network. When 4 requirements can load VPS to 50% because the VPS is still waiting for the rest of the request. Consequently, you will be accused of having your VPS extracting infrastructure and simply canceling it. But he doesn’t return the money. I’m not the first to ever get this. Obviously, it’s their own tactic.